Order from Oxford University Press. Order from Amazon. Use and enjoy the list of media resources—links to videos, audios, songs, movies, infographics, commercials—keyed to illustrate the text. Nestle (nutrition, New York Univ.) once again exposes the dark side of the food business. As in her 2007 Food Politics: How the Food Industry Influences Nutrition and Health, the author examines the soft drink industry, demonstrating how products that are basically flavored water with added sugar contribute to obesity, type-2 diabetes, and metabolic syndrome. She discusses the composition and production of soda, the adverse effects of excess sugar consumption, and product marketing. The companies’ targeting of children, low-income, and minority communities; lobbying of Congress to prevent legislation that would impact profits; funding of research to produce results that obscure the facts about soda; and donations to health organizations and charities in order to be portrayed as socially responsible corporations make it difficult for citizens to act. Nestle reveals what can be done and how to do it, providing relevant data, analyzing that information, and illustrating its difficulties. She then advocates for smaller portions, taxing sugary drinks, and excluding soda from the Supplemental Nutrition Assistance Program (SNAP) and provides examples of successful campaigns, a list of groups advocating for healthy beverage choices, and extensive notes. VERDICT An outstanding manual for health educators, activists, and anyone seeking information about the soda industry and its impact on health.— Barbara Bibel, formerly Oakland P.L. For me, the single most stunning and appalling revelation comes in the section about environmental impact and industry responses to it. It is that between 340 and 620 litres of water are used for every litre of soft drink produced, about 20% of that related to packaging. Despite such disturbing revelations,Soda Politics is not discouraging…Throughout the book, Nestle provides tactics for practical, local advocacy, such as working with school wellness committees and engaging local policymakers. And since 2002, the proportion of US citizens who say that they avoid soft drinks has risen by 20%, reaching nearly two-thirds of the population…For public health to prevail over soda politics as usual, we have miles to go. This book is the richly drawn map of how to get there, from here. The standard operating practices of companies like Coca-Cola and PepsiCo demand the same level of scrutiny as cigarette companies, and for many of the same reasons, argues Marion Nestle in the introduction of her new book, Soda Politics. What follows is a thorough and unflinching look at the soft-drink industry’s role in promoting the consumption of sugary drinks despite growing evidence that they are detrimental to our health. The book begins with a basic primer of the range of health problems that have been linked to soda consumption, from tooth decay to obesity and diabetes, hitting its stride with an eviscerating assessment of the industry’s marketing and advocacy practices. 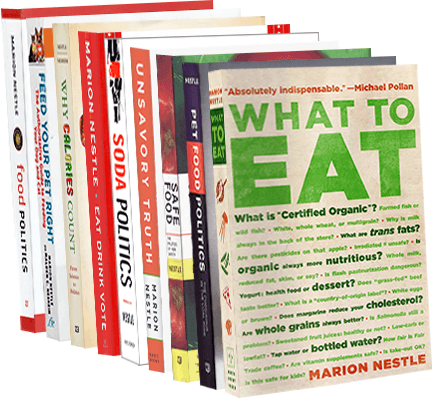 For those readers who share Nestle’s critical perspective on the food industry, it is obvious that this book would be informative. But here is the greater surprise: this solid book is by far the best source on this topic for any reader, with any perspective on economics or politics. If I worked for a trade association, or an industry front group, or an esteemed professional association that relies on soda industry funding, or the House Agriculture Committee, or a sugar manufacturer, or a high-powered corporate law firm, I might store this book in my desk drawer rather than my book shelf … yet I would read it word for word. In Soda Politics (OUP, £19.90), Dr Marion Nestle does us all a great service by spelling out clearly and authoritatively the dreadful price we are paying for guzzling gallons of sugared water – Coke and Pepsi by any other name. Big Soda, as Dr Nestle calls the billion-dollar corporate giants behind this poison, know exactly how bad their products are for us but are so powerful no one takes them on. Rise up and rebel, Nestlé urges. Nestle writes like an investigator hunting every possible scrap of damning material for a prosecutorial brief, which will no doubt make her book an excellent resource for activists and reformers seeking remedies in Washington, in the courts, and, perhaps, in the aisles of the local supermarket. Big Soda knows what it’s doing. Fortunately, so does Marion Nestle. The nutrition professor, advocate and investigator best known for “Food Politics” profiles the soft drink industry in her expansive, superbly researched new book, “Soda Politics: Taking On Big Soda (and Winning).” It isn’t so much a narrative as a well-organized barrage of facts, some eye-popping (the world’s soda companies produce nearly two trillion 12-ounce servings annually), others banally incriminating. They come off the page like jabs in a sustained pummeling lasting more than 400 pages. Even if Nestle is only half right, it’s still a total knockout. Drinks companies must also reckon with a small army of health advocates, among which Ms Nestle is a major-general. This is a food advocates’ book which forensically analyses the tactics of the ‘Soda’ industry. Nestle is foremost an educator and an activist, and Soda Politics is worth its price alone for the chapters on advocacy, from recruiting public health leaders and working from within to protecting public water resources…In other words, we can change things, one Big Gulp at a time. Caffrey M. Is soda the new tobacco? An expert and new CDC data say yes. American Journal of Medical Care 2016;22(4):139-141. Sabnavis M. Bitter fizz. Financial Express (India), March 20, 2016: A book that exposes that there’s more ill in a cola bottle than mere sugar—environment costs, high water use and pure politics. Das Gupta U. The bitter fight over sugary drinks. Business standard (India), March 22, 2016. Angier N. The Bear’s Best Friend. New York Review of Books, May 12, 2016: 56-58. Janer Z. Profit Before People: The Case Against the Soft Drink Industry. The Wire, April 24, 2016. Hearne SA. Behind the curtain. Health Affairs, May 2016:936. Mosaffarian D. The politics and science of soda and our health. The Lancet 2016;387 (May 28):2190-2191. Wineberg D. The San Francisco Review of Books. October 20, 2018. April 14 Opinion piece in Reforma.com (in Spanish). Dec 9 Edible Manhattan and Brooklyn, Favorite Books. Oct 6 Radio interview with Dr. Mercola, with transcript. Oct 5 Caselli_Mechael L. “Soda Politics” & science: 5 issues. Food Insight, IFIC. Sept 28 Interview podcast with Dr. Mercola. Condensed version. Full version.